Kryon McMaster, who won the National Jr. College’s 400m Indoor Championships in March and was subsequently released by the school following an injury that prevented him from competing outdoors, then went on to win the BVI’s first IAAF World Jr. Championships medal in July, signed a letter of intent last Wednesday, to become a member of the Florida Gators in 2017. McMaster, 19, was a second semester freshman at Central Arizona College when he won the 400m title, then hurt his lower back after and was unable to perform, was cut by the school—never getting a chance to represent them outdoors. 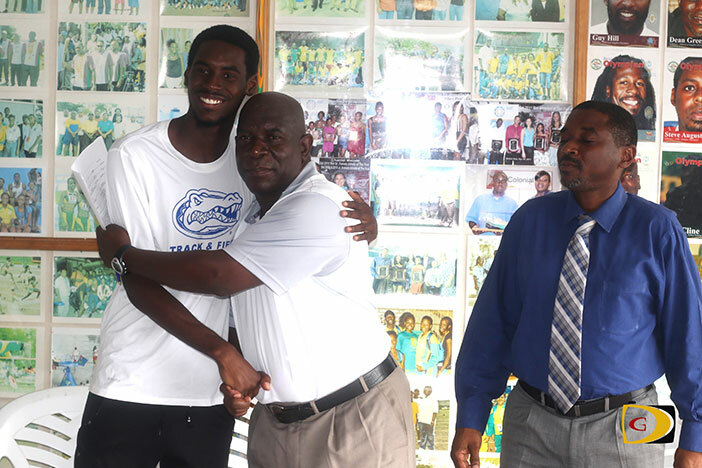 He missed his last Carifta Games in Grenada over the Easter Weekend and didn’t compete till May in Florida, where he qualified for World Jrs. In all, he competed in six races outdoors—finishing five of them including winning the 400m bronze. Florida, Mc Master noted, has the best two NCAA 400m Hurdlers and Olympic champion Kerron Clement trains there. It’s also where the U.S. Virgin Islands’ 110m Hurdler Eddie Lovett matriculated. “Florida has a really good hurdles program so in terms of getting me better and getting me to that next stage, Florida would be the one to do it,” he said. In retrospect, McMaster sees the silver lining, from getting injured, winning a historic medal for the territory and now getting the opportunity to compete at one of the top program at the collegiate level.